On this New England summer adventure, escape from Boston for a day and journey to scenic Cape Cod, where sparkling beaches, lighthouses, cottages, sailboats and fishing villages await. Travel across the Cape Cod Canal and stop in Hyannis Port to visit the JFK memorial, and then enjoy a relaxing, fully narrated sightseeing cruise (weather dependent), offering unbeatable views of the Kennedy Compound. Stop in the town of Sandwich and the Sandwich Glass Museum & a glass blowing demonstration. Spend the rest of your day sightseeing and shopping in charming waterfront villages along the Cape. Your New England summer sightseeing tour begins with morning pickup from your downtown Boston hotel (if pre-arranged at time of booking). 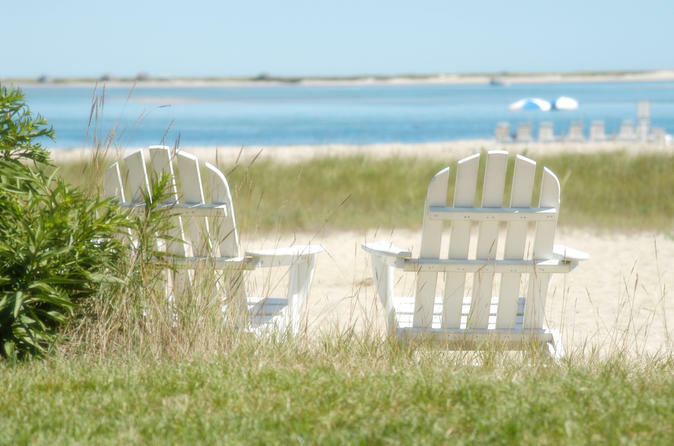 Hop aboard a luxury coach for a comfortable drive south to Cape Cod. This sandy peninsula -- a common retreat for New Englanders -- is lined with 400 miles (644 km) of pristine shoreline dotted with cottages, sailboats and quaint fishing villages. Stop in Hyannis Port to visit the John F Kennedy memorial. This small residential village is home to the Kennedy Compound and other Kennedy family residences included in the National Register of Historic Places. Next, hop on a boat (weather dependent) for a relaxing, fully narrated sightseeing cruise along the Cape Cod Canal, offering the best possible view of the Kennedy Compound. Learn about the waterfront sights as you soak up the relaxing New England atmosphere and admire lighthouses scattered along the coast. Next, we will head to Sandwich and stop at the Sandwich Glass Museum. Explore the museum and its nearly 5,000 pieces of glass; take the opportunity to watch a 20 minute glass blowing demonstration. Spend the rest of your day sightseeing and shopping in quaint seaside villages along the Cape. Grab lunch (own expense) at one of the many eateries – the Cape offers some of the freshest seafood imaginable, especially lobster. At the end of the day, relax on your drive back to Boston. This tour is seasonal and only operates from June through September.